There would be no perfect birthday without cupcakes. Already my cupcake friend Anne sent me a lovely cupcake postcard with even lovelier birthday wishes. So thank you first of all. I have to mention her when I talk about cupcake happiness, because she was the one who opened the world of cupcakes to me. 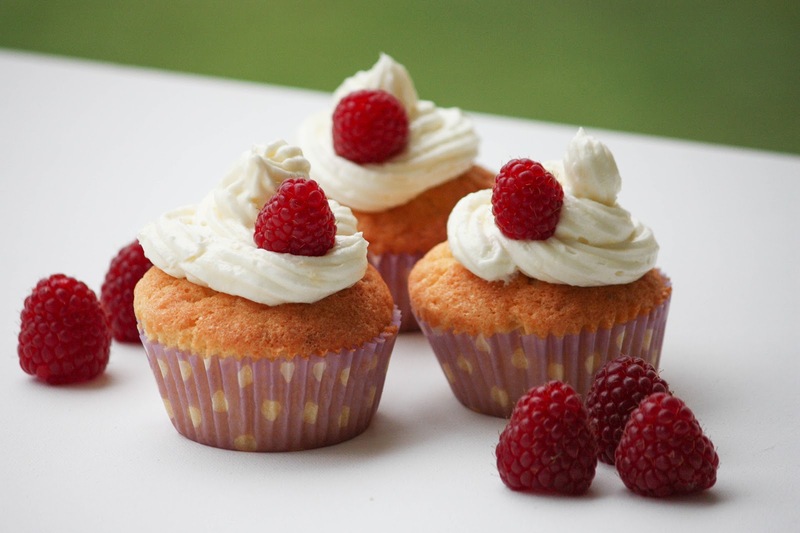 Yes, cupcakes are not only a good-looking dessert; no they also have emotional value. And on this special day, my birthday, which I am supposed to enjoy, and I definitely do, cupcakes have to be part of it. I guess you got it. I love cupcakes. And for former birthdays, my friends offered me recipe books of all kinds, indicating the best looking and the tastiest cupcake recipes. 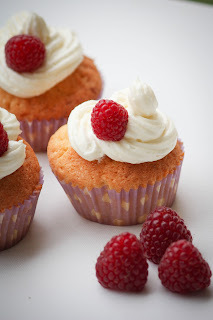 The one I chose is a combination I really like: white chocolate and raspberries. I allowed myself to change the recipe a little bit. Normally I am not that courageious when it comes to baking. 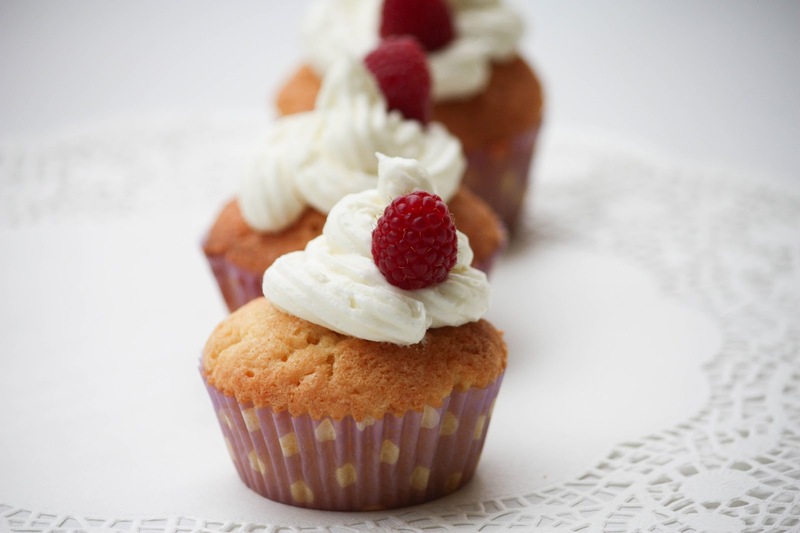 With cooking no problem, but with baking I am always a bit hesitating to change things. But so far, I cannot complain about the outcome. Anne, if by chance you read this during your holidays, please do know that I would have given a lot to share these with you!!!! But for all the others, I am totally willing to share with you. The only thing you have to know is, that you have to be fast enough otherwise there won't be any left. I can tell from experience, that they disappear quite quickly. In a large bowl whisk together the eggs, the sugar and the butter. Then add the flour and the baking powder. Now you can add the white chocolate chips. 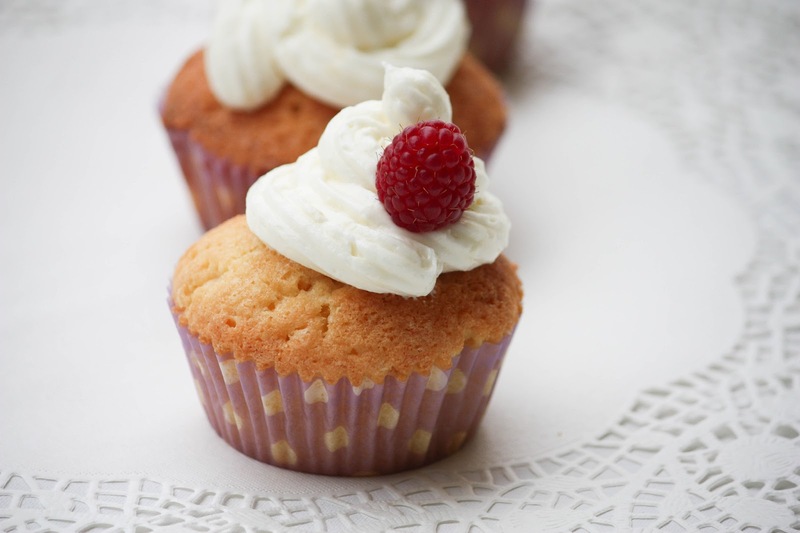 Place the paper muffin cups into the mold and add 1tbs of dough. 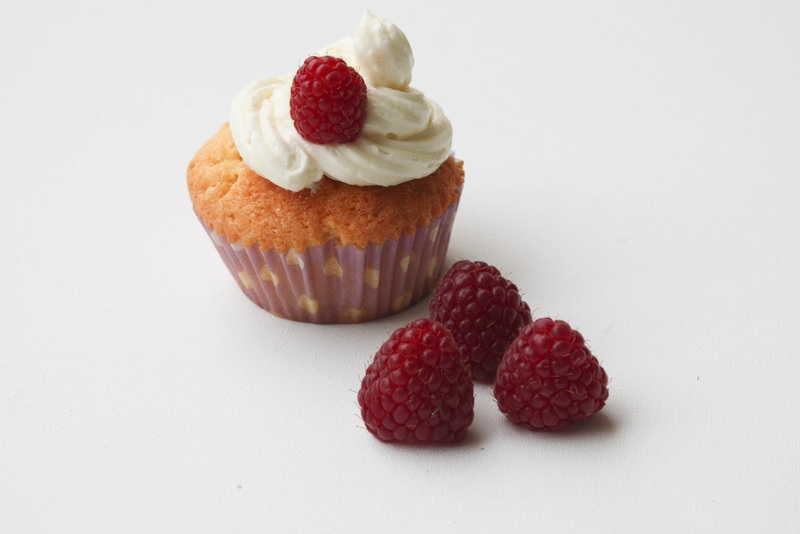 Then add one raspberry onto the dough and fill the muffin cup 3/4 full with dough again. Bake the cupcakes for 20 minutes. Whisk the cream cheese and the icing sugar together. Add the butter and the vanilla extract until you get a creamy paste. Put the icing cream for 10 minutes into the fridge. Then decorate the cupcakes. 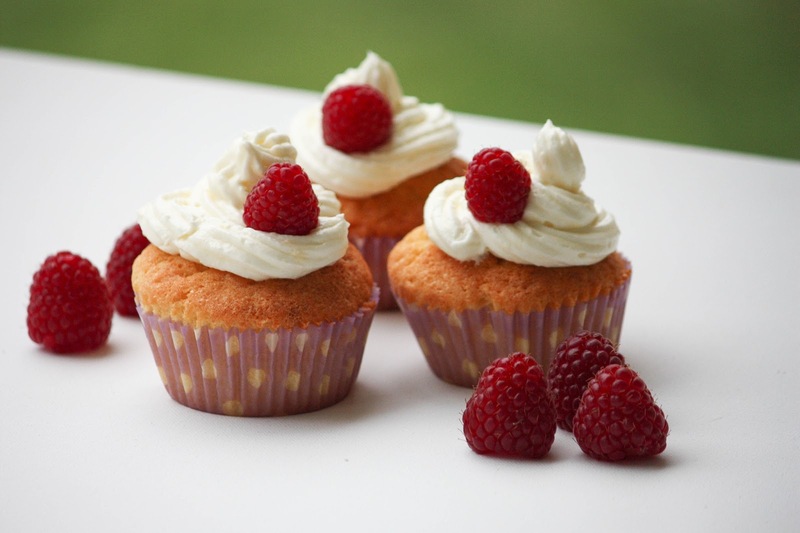 To put another fruit element on top, decorate each cupcake with a raspberry. No room temperature is enough, no need to melt. Hello again! I just made these cupcakes and OH MY GOODNESS are they super yummy!!!!!!!! I can see how yours were gone in an hour. I will be making these for my nephews wedding this weekend and was wondering if you knew if I could add melted chocolate instead of the chocolate chips for a smoother mouth feel. I may experiment but they are delicious as-is. Thank you again!!!!! Hello again, yes you can also melt the chocolate. The taste is a bit different but still very delicious.